Kids with sensory needs can benefit from a themed intervention. The child that craves sensory input can benefit from a set of sensory activities that are designed around their special interests. The same holds true for the child who pulls back from sensations. A set of sensory activities with a special theme can be motivating for the child who avoids specific sensations, positions, or textures. This post is one in a series of special-themed sensory activity sets. You can find all of the special interest activities on our Sensory Interests Series. Maybe there is a set of activities that is perfect for your child's individual interests. You'll find everything from sports to dolls to cooking, with more special interest sensory themes coming soon! 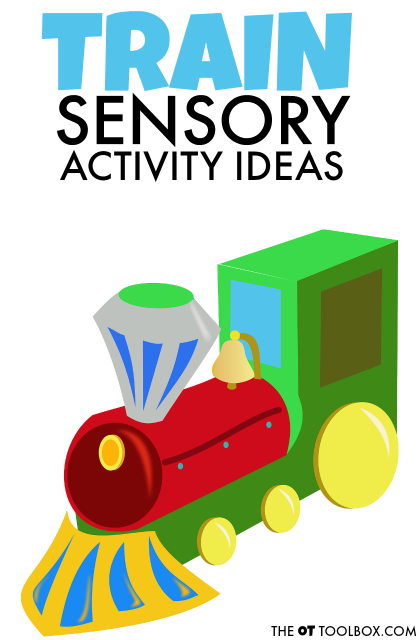 These activities and interest-led sensory-based ideas can be a great addition to a sensory diet. Read more about sensory diets. Add these resources to the ones you can find here under sensory diet vestibular activities to meet the sensory needs of all kids. If there is a special theme you are looking for, shoot me an email at theottoolbox.com and I will do my best to come up with a set of activities based on that theme. Need information about sensory processing? Grab this free sensory processing booklet. Does your child LOVE trains? These sensory activities are designed to meet sensory needs in a motivating manner. Push 2x4 wood pieces or wooden blocks with both hands down a driveway or sidewalk. There is a lot of history and research based on using sanding as a means of therapeutic intervention. Pushing a wooden block along a resistive surface applies proprioceptive input through bilateral resistive wrist, elbow & shoulders. Add additional blocks of wood to create a train. Fill a cardboard box with books or other heavy items. Push it along a carpeted room. Add other boxes to the train. Try to keep them in a line. This is a great way to work on motor planning and core strength as kids balance to keep the boxes in the train aligned. Try this with books or crates. Draw tracks on a paper with pencil. Children can use a rectangular school eraser as a "train" to erase the train track lines. Draw the lines with heavier pressure for more required proprioceptive input. Drawing with lighter strokes requires less heavy work. Also try a kneaded eraser. Fill a laundry basket with books, blocks, or other heavy items. This can be a train cargo car that needs loaded and unloaded in order to set off on a delivery. Kids can act like a crane with whole body movements. Fill a plastic sandwich bag with dry beans. Reinforce the edges and sides with heavy duty tape like duct tape. Cover the entire plastic bag to create a DIY bean bag. Stick train stickers to the outside of the bean bag. Use them to play target games. These train beads would come in handy for heavy work to the hands. Hide them in silly putty, slime, or thera-putty. Hide them in play dough and then freeze the dough to add more resistance. Kids can find and hide the train beads for proprioceptive input through the hand and finger joints. Tape pieces of paper to the floor in a line. These are the "tracks" of a train. Kids can hop, leap, or jump from paper to paper as an indoor heavy work activity. Use sidewalk chalk to create train tracks on a large sidewalk or driveway. Hop, run, leap, skip, or jump on the track from stop to stop. Stick masking tape to the floor of a carpeted floor. Ask kids to send animals on the train! They can do different animal walks along the tracks to get from train stop to train stop. Animal walks that add proprioceptive input include: bear walk, crab walk, frog hop, or donkey kicks. Make a train with friends and walk over couch cushions and outside down slopes and on slanted grassy surfaces. Use a therapy scooter board to pull the child using therapy band or a hoola hoop. The child can pretend they are on a train as they ride in various directions. March along a path or balance beam like a train. 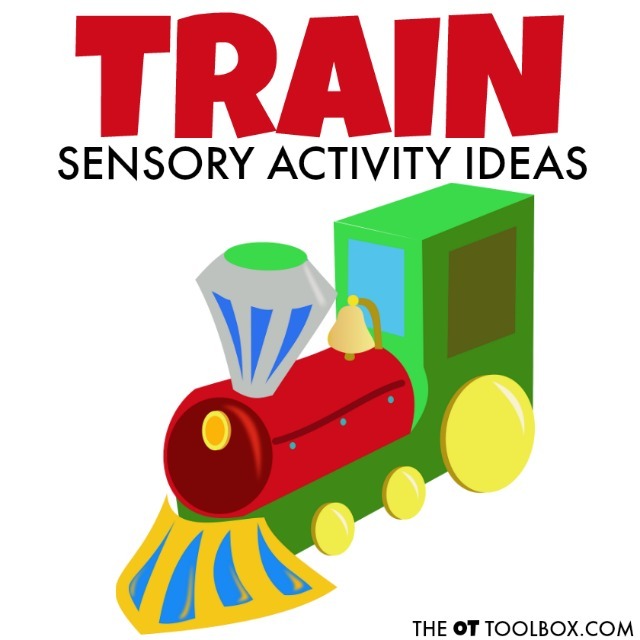 Make a Train Whistle to address oral motor and proprioceptive needs. Kids can use a recycled cardboard tube such as a paper towel roll. Using a sharp pencil, punch a hole in the middle of the tube. Cover one end with a small piece of wax paper and attach with a rubber band. Use the tube like a kazoo. When kids blow into the hole, a buzzing noise like a train whistle is produced. Use this DIY train whistle craft as a tool for sensory needs. Use a train whistle to create loud or soft whistles. Listen for the volume of the whislte and play a matching game where kids need to copy the intensity of sound. Try this with patterns, too. Make an easy train themed busy bag. Ask kids to guess the items in a bag without looking and just using the sense of touch to identify shapes and items. 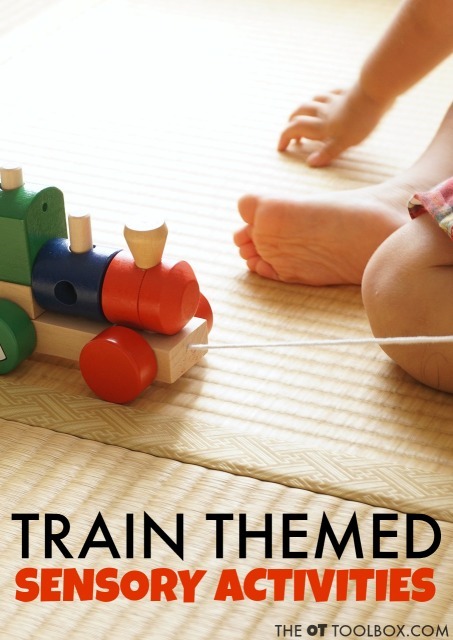 This activity is based on the children's book, Steam Train Dream Train. Make a train-shaped cheese and cracker snack plate. Make this crunchy train theme graham cracker snack. The kids can help make this healthy train themed snack using fruits and vegetables. These activities are designed to be taken out of the home or classroom. Use them while out in the community, while in the car, or when traveling. Create a travel sensory bag with fidget toys, train activity cards, sensory snacks, or weighted tools. This train key chain is a great fidget tool that can be attached to backpacks, jackets, binders, or belt loops.